Grove - IR Distance Interrupter is used to detect any object blocking the path of light. 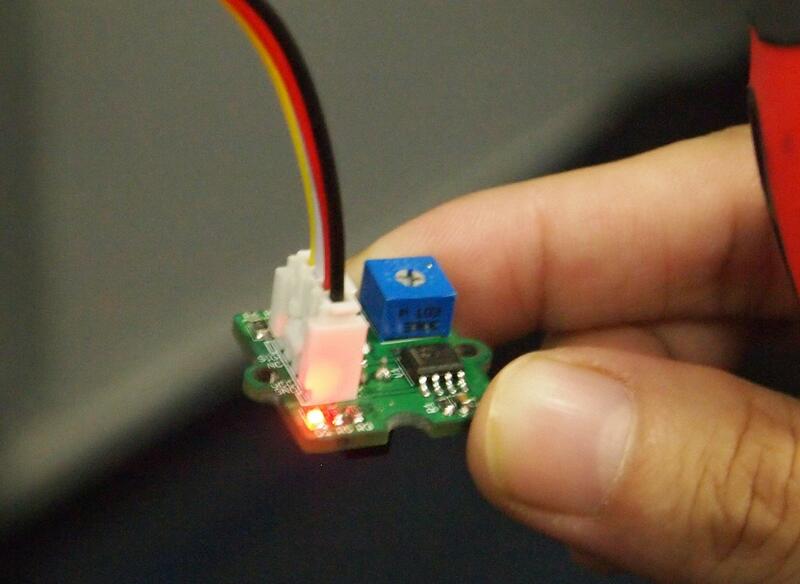 The module consists of an IR LED and a photosensor (phototransistor) pair. The light emitted by the IR LED gets reflected by any object placed in front of the sensor and this reflection is detected by the photosensor(phototransistor). Any white (or lighter) colored surface reflects more than black (or darker) colored surface. When the reflected light is detected, it produces Digital HIGH (or Binary 1) output on the SIG pin. The on-board LED indicator will also glow. If no reflection is detected or if the object is too far from the sensor, the output on the SIG pin stays at Digital LOW (Binary 0). The on-board LED indicator will be off as well. The detectable range of this sensor is 7.5–40 cm. The module incorporates a Rail-to-Rail Operational Amplifier to amplify the output of phototransistor. 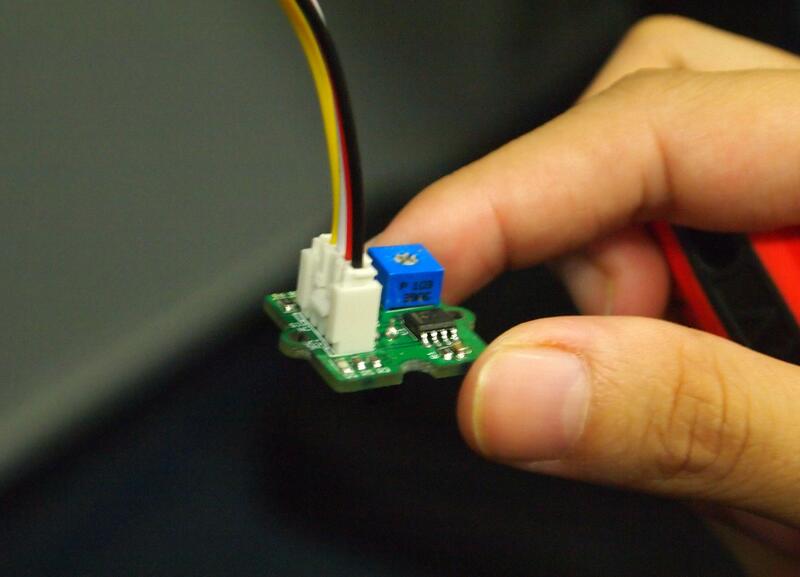 There is a potentiometer which can be used to adjust the gain of the amplifier, that is, sensitivity of detection. This product is mildly sensitive to non-IR radiations also and hence any bright light on photosensor impairs or disturbs IR light detection. The instructions to use this product are same as Grove - Infrared Reflective Sensor's. You can use this product directly if you have used Grove - Infrared Reflective Sensor. ITR9909 Reflective photosensor, Highly sensitive reflective photosensor. LM393 operational amplifier, rail-to-rail operational amplifier. LED Indicator, The LED will turn on when the received infrared light intensity exceeds a preset level. 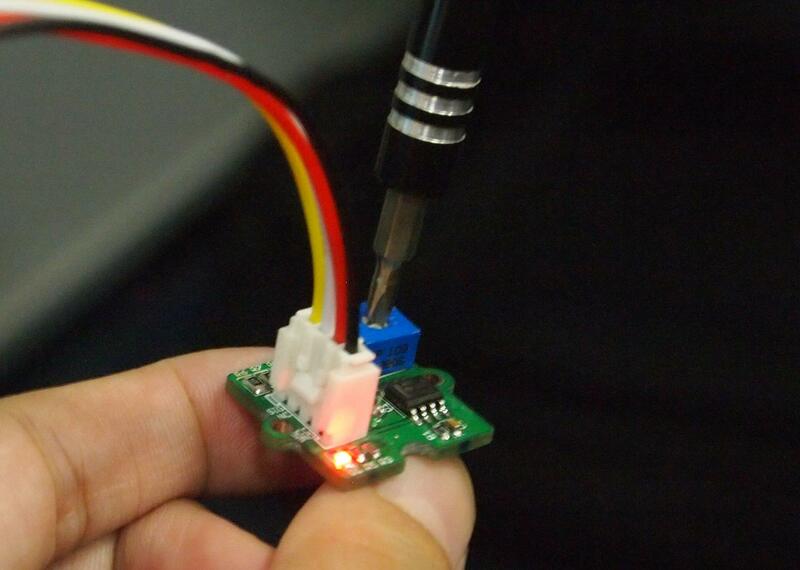 Light sensitivity adjusting potentiometer , adjust the sensitivity of reflective photosensor to light. 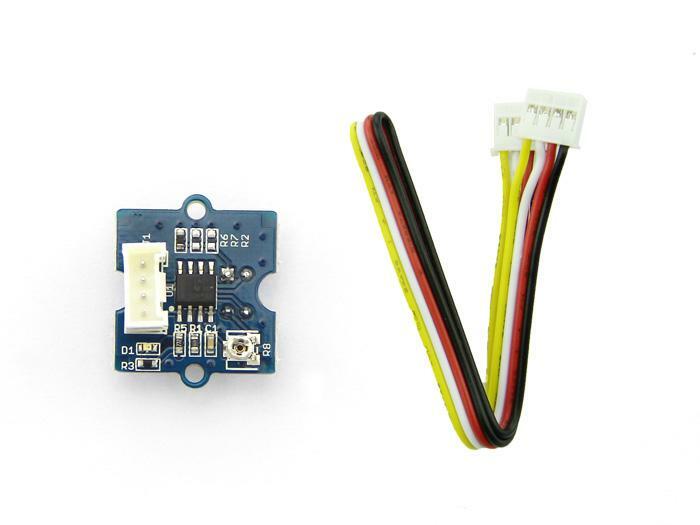 1.Connect Grove - IR Distance Interrupter v1.2 to Arduino UNO with Grove cable. 2.Place and hold the Reflective photosensor towards white(or light) colored surface. 3.Adjust the potentiometer with a screwdriver to change the sensitivity of reflective photosensor, until the LED indicator glows. As your rotate clockwise, the reflective photosensor will be more sensitive to light. 4.Create an Arduino sketch and copy the below code into it. 5.Upload the code. If you do not know how to upload a Arduino sketch, please visit https://www.arduino.cc/en/Guide/Windows for Windows user or https://www.arduino.cc/en/Guide/MacOSX for Mac user. You can see the result as below. 6.When the path of light is blocked by some object, you would see "Somebody is here." in Serial Terminal else you will see "Nobody." 1.You should have a Raspberry Pi and a GrovePi or GrovePi+. In this demo, we use GrovePi. 2.We assume you have built the development environment successful. If not, follow this tutorial. Plug Grove - IR Distance Interrupter into port D4 on GrovePi with Grove cable. 4.Navigate to the demos' directory, run the following command in a terminal. Copy and save the following code into it. 5.Run the demo, run following command in terminal.